"and I may add that I was a member of the Flying Corps during the late war". Lasseter to Gepp 22/11/29. N.A.A. A1/15-1930/512. Much has been written about Lasseter's flight with Pat Hall in the Golden Quest II from Illbilla to an indefinite point somewhere to the southwest on 03/09/30, the purpose of the flight was to see if Lasseter could pick up his landmarks that would indicate the location of the reef. This was Lasseter's first flight in an aircraft, although he had professed some enthusiasm for aviation prior to the expedition. The earliest reference appears in Lasseter's military file where a medical review finds him unfit for military service due to 'mental deficiency' and adds, "has marked hallucinations, wants to join flying corps as a friend is going to present him with an aeroplane". In his November 1929 letter to Herbert Gepp, Lasseter declines the offer to search for the reef from the air, using the large aircraft the 'Canberra', a generous offer that may have called Lasseter's bluff. Lasseter goes to some trouble to reassure Gepp that he is not afraid of flying, "in fact it was one of the ambitions of my life to fly", and adds that he was a member of the Flying Corp during the first World War, but couldn't claim any flying experience as he was 'laid out' the day he joined, Lasseter's real concern was the 'birds eye view' is very different from that at ground level and a truck would be safer and surer. 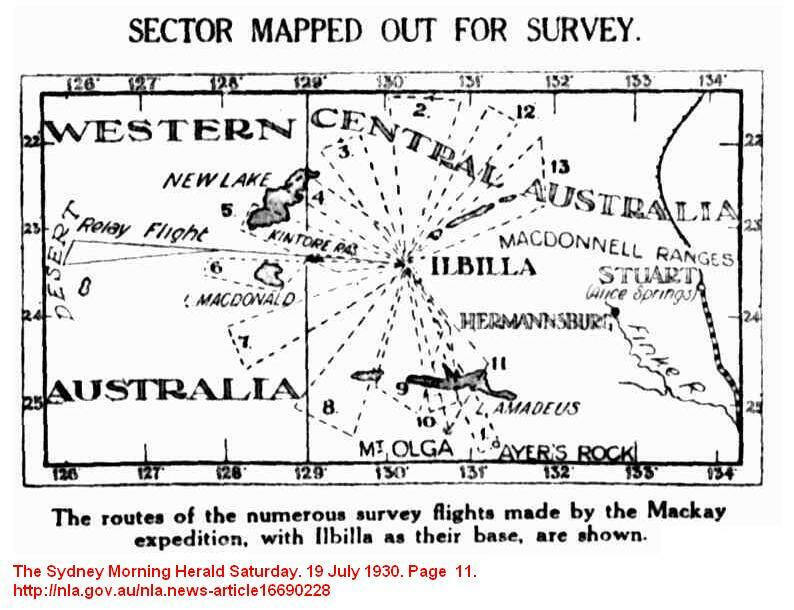 In a February 1930 letter to Calanchini of the Western Australian Mines Department, Lasseter mentions Gepp's offer and reinforces the difficulty of locating the reef, 14 miles long, from the air. Due to the quartz, "having the reddish tinge of the surrounding country". Lasseter would prefer to travel to the reef in a six wheel caterpillar tractor, from a point on the North West Stock Route, at about the 23rd parallel. Having so far avoided an aerial search for the reef, Lasseter was confronted with the prospect of making his first flight at Ai Ai Creek on the morning of the 3rd of August 1930. Blakeley had asked, perhaps challenged, Lasseter to go up in the Golden Quest with Coote and put the plane to it's intended use and reconnoitre ahead of the ground party, and who knows Harry may recognise his landmarks. Coote for once displayed some common sense, and told Lasseter to wait while he tested the take off and landing, the airstrip looked a little on the short side to Coote. Lasseter was a lucky man, his first flight could have been his last, the plane barely cleared the trees at the end of the strip, and the pilot had a few shaky moments, the landing was equally dangerous. If Lasseter's extra weight were aboard the plane that morning it's quite possible both men would have been seriously injured, perhaps killed. Lasseter had fortunately avoided flying again. He could no longer avoid the issue at Illbilla on 3/9/30, Pat Hall and Coote had returned with the Golden Quest II, and Lasseter was more or less obliged to carry out a aerial reconnaissance to the south west, with Hall piloting the plane. Lasseter finally achieved his life's ambition and according to Coote, eagerly boarded the plane for his first flight, searching for landmarks and a way south west for the truck. There are only two first hand accounts of the of the flight, Blakeley and Coote, Hall apparently left no record and Taylor's Diary was burnt at Ayers Rock. The plane set off in a south westerly direction with the wind from the north west, and was away for an hour and forty five minutes according to Blakeley and Coote records that it over two hours before, "a faint hum was heard almost due west of the aerodrome". The men crowded around the plane, but for the time being all Lasseter would say, was the expedition was still 100 miles or more too far north and the track for the truck looked difficult but passable. Coote, aware of the sullen and sceptical mood of the men, took Lasseter aside and pointed out his obligations to the Company and shareholders, Coote had invested a lot of money in the expedition and was responsible, "for a large number of people putting money into this show to back you", Lasseter's reluctance to reveal the location of the reef centred around the presence of Colson, a non shareholder, and dislike of Blakeley, unreasonable objections as for as Coote was concerned. Under pressure, and probably to buy time, Lasseter told Coote the 'Lake Christopher as a radial point' yarn and asked Coote to keep this information to himself for the time being, which Coote agreed to do. Lake Christopher and Coote's integrity are discussed elsewhere. Lasseter's flight has produced considerable speculation, all of it useless, on exactly where and how far the Golden Quest II flew and what landmarks Lasseter may have seen that day. As far as Lasseter was concerned his first flight was quite successful, he saw the two landmarks he wanted to see, the Petermann Ranges some thirty to forty miles ahead and the uncrossable Lakes Neale/Amadeus depression. Lasseter would get his camels yet, and perhaps more important from his point of view, separate from the main expedition. Blakeley Fred Dream Millions 129. Coote E.H. Hell's Airport 153-158.